On February 7th, CEAB and EPAG associations have been dissolved before notary. Their activities and assets have been merged with those of CEPI. At the same time, CEPI has adopted new statutes and its General Assembly has elected a new President and eleven new members of the Board. 29 associations have signed the new statutes. Timo Multanen was elected President of the association and of the Board for one year, with the specific mission of dealing with the merger process and to establish the operational bases of a consolidated CEPI. Claudine Speltz was elected President of the property managers’ professional committee, and Jan Boruvka, President of the real estate agents’ professional committee. 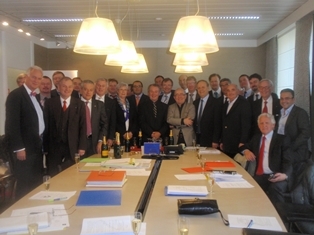 By their function, they become Vice-Presidents of the association and of the Board for two years. Mark Van de Woestyne and Jens-Ulrich Kiessling were respectively elected Treasurer and Secretary General of the Board. Moreover, six representatives from CEPI members associations have become administrators, namely Leonardo Caruso, Alain Duffoux, Jaroslaw Zielinski, Yves Boussard, Hugh Markey and Steen Winther Petersen. The Board has nominated Xavier Ortegat as Managing Director. The President congratulated the new Board and has reiterated its will to strengthen the association leadership. In the same perspective, the Board has temporarily decided not to set up a management board and to ensure itself the follow-up of the ongoing dossiers.